Our Perhimpunan Keluarga (aka camping) this year will be held at Ashworth Valley Campsite. The annual Perhimpunan Keluarga is a key factor in bonding the friendship amongst our members. As in the past, we are proud to inform that this year's Perhimpunan Keluarga will be also attended by many non-Malays. This proves that the resident Malay community is not an isolated community but is increasingly playing a bigger role in the British community. The number of second and third generation Malays in our community has increased steadily over the years. This year's Perhimpunan Keluarga will focus on pro-active role of the Malays in the Britain. This year we have booked 1 building with basic indoor accommodation and an area for camping. As there will be limited indoor accommodation, participants are requested to bring their own tents. 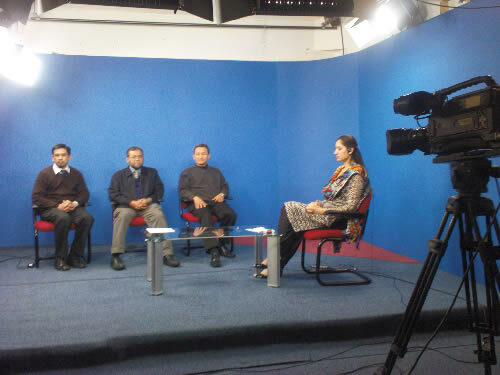 Update: Mobile clinics will be held in conjuction with Islamic Medical Treatment courses. Please visit www.pisang.org.uk for the latest information. Melayu UK and PISANG (Professional Islamic Support and Nurture Group) plans to hold another mobile clinic for the screening and treatment of jinn-related problems. Jinn can cause some illnesses and modern medicine will not be able to cure those type of illnesses. Screening will be done using the Ruqyah Shar'iyyah methodology and we are planning to fly in Al-Hafiz Ustaz Trimizi Zainal to conduct the clinic. PISANG is a non-profit organisation registered in the UK and has carried out many mobile clinics in Malaysia, Australia, Brunei, Singapore, Jordan, Egypt and UK. PISANG is highly dependent on donation to fund its activities and we hope to collect donations to cover the cost of organising the mobile clinic. Screening and treatment services will be provided free-of-charge. However we encourage donations to cover our cost. Please send us an email if you wish to pledge donation for the planned mobile clinic. PISANG is also planning to organise a course on Introduction to Islamic Medical Treatment. Please contact us if you are interested in taking the course. Practical Approach or Deviant Teaching? Within 100 days of Pakatan Rakyat's rule in Selangor state, it was reported by the media that Islam Hadhari (Civilisational Islam) was banned (Malay terminology used: haram) by the state government. A few days later after heated exchange of words, the "haram" terminology was changed to a milder "no longer promoting". A few other Pakatan Rakyat states later follow the footsteps of Selangor. What is so controversial about Islam Hadhari? Is there any substance in the "banning" of Islam Hadhari or was the "banning" a result of political sentiments? 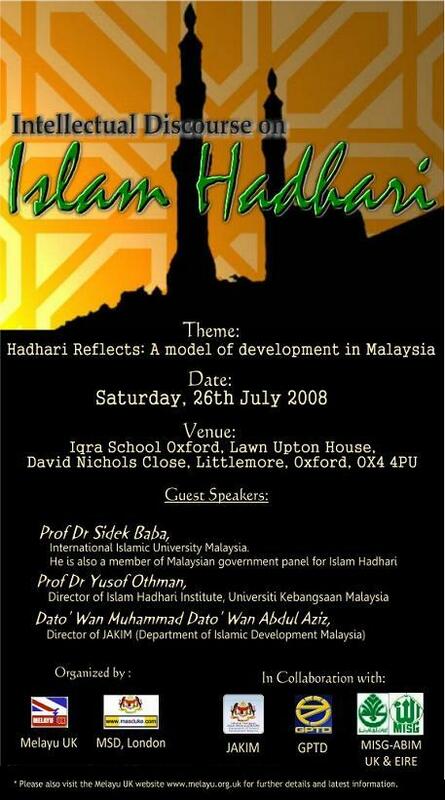 Melayu UK is proud to organise an Intellectual Discourse on Islam Hadhari. This event will enable us to hear the version from the promoters of Islam Hadhari and also an occasion where participants can challenge the promoters or prove that Islam Hadhari is a deviant teaching. This event is a platform for intellectual discussion and we hope at the end of the day we will have a clearer picture of Islam Hadhari e.g. is it an approach that we can apply globally especially in the UK, or is it a deviant form of Islam that has to be rejected. It is important for us to attend the event as the intellectual discussion can differentiate us from those who pick up bits and pieces of information from YouTube or junk emails. To be good leaders, we have to equip ourselves with knowledge instead of just relying on rhetoric. You can turn up at the event on the day. However we prefer you to pre-register as this will help us with in ensuring the smooth running of the event.